Residing in Eureka Springs, Arkansas, since 1999, Emily is originally from Oswego, New York. Her childhood dream of working with tigers eventually led her to the State University of New York at Oswego where she obtained her Bachelor of Science degree in Zoology. 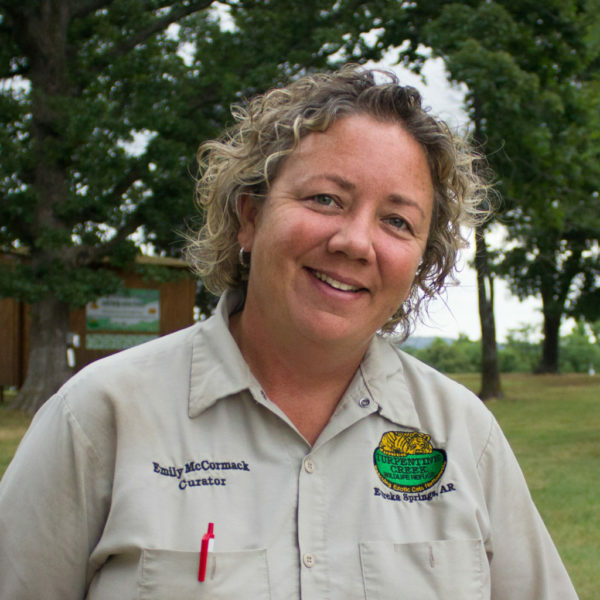 Her initial internship at Turpentine Creek Wildlife Refuge in Eureka Springs, commencing in January of 1999, fulfilled her final three credits before receiving her degree. Upon completing her six month internship, Emily was so highly regarded by the founding members of the rescue facility that she was hired on to become a permanent staff member. Her passion and commitment to the 100+ exotic cats at Turpentine Creek is extraordinary, and she quickly became a major force in improving the lives of these magnificent animals. Having excellent people skills in addition to her dedication to the animals, Emily was promoted to the position of Volunteer Coordinator/Intern Supervisor in 2002. Through her expertise and guidance, more than 300 college graduates have also graduated from the acclaimed Internship Program at Turpentine Creek. While still retaining the responsibilities of Intern Supervisor, Emily was also promoted to the position of Curator in April of 2011. Combing a number of skill sets with ease, Emily can be seen on any given day managing animal care in countless ways, rescuing animals in need from a variety of locations and situations, guiding interns in the safe and proper care of the animals, leading VIP tours around the rescue facility, supervising habitat construction, or scheduling and appearing for public events.